Jenna joined me on Wednesday to visit our Grandma. We had a really difficult game of scrabble. I think our grandma beat us by about 100 points! I kept getting all the U's! We did enjoy the time together. Her arm is slowly continuing to heal so that is good news. 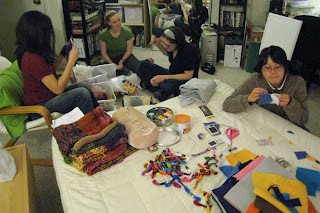 Wednesday night I went to Amy's crafting night at Laurel's house. It was fun seeing all the different crafts that people do! I brought a bunch of my felt collection and donated it to Amy and her evening. I haven't played with felt in a long time and I'm still working on simplifying my life. I started making my mom a felt owl. I'll post pictures when its done. Thursday was such a busy day! I met Eva & kids for lunch at a yummy Chinese restaurant and then we spent 3+ hours wandering around the SF zoo. 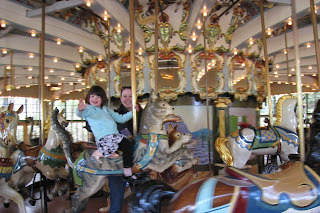 We had fun riding the carousel and we were so lucky the weather was decent while we were visiting. I brought a ton of rain gear thinking it was going to rain, the clouds were really dark. 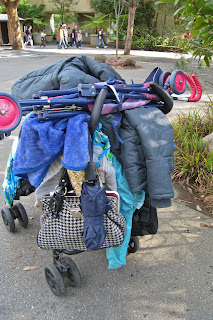 Josiah's stroller ended up looking like some kind of pack mule. Michelle, Tell your Grandma that I was glad to see her picture and Jenna's on your blog. Also glad her arm is getting better. 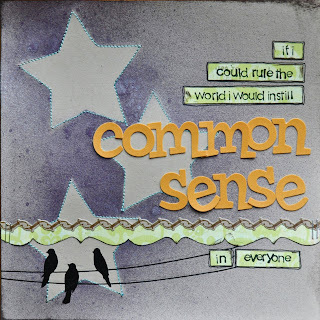 your layout is amazing- I love the background and the design and the saying!!! 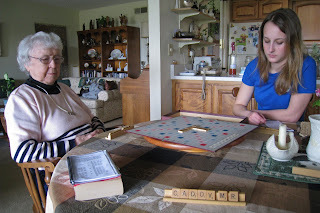 Beautiful photo of you and your Grandma playing Scrabble- love that! Your mojo layout is wicked!!! The glimmer mist rocks, and I love the birds on a wire!